We are excited to announce a new partnership between STAND and the Responsibility to Protect (R2P) Student Journal at Leeds University! Because STAND knows that approaches to genocide and mass atrocity prevention are multilateral and layered, we are thrilled to expand our existing genocide prevention initiatives into academia. 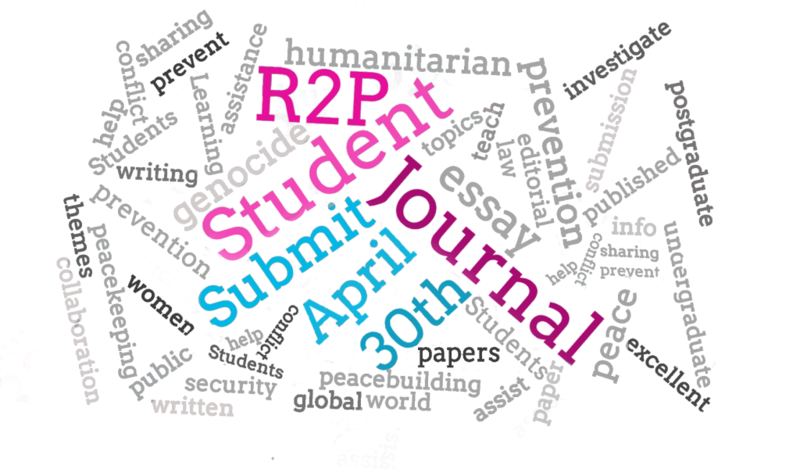 The Responsibility to Protect Student Journal is a global, student-led, free online journal that aims to provide a platform for undergraduate and postgraduate students to publish their academic work on R2P and related topics, including international humanitarian law, human rights, international criminal justice, and, genocide and mass atrocity prevention. The Journal was founded in 2015 by a group of students from the University of Leeds and the Graduate Institute of International and Development Studies. We are looking for excellent student essays and dissertation excerpts for the R2P Student Journal and short commentaries, analytical pieces, and creative work for our Blog. We welcome submissions on R2P-related topics including mass atrocity prevention, humanitarian intervention, international criminal justice, peacekeeping, peacebuilding, genocide, international humanitarian law, UN Security Council decision making. This is not an exhaustive list, so please get in touch with us if you are unsure of whether your work meets our admissibility criteria. Word count: 2,500-6,000 words (footnotes and bibliography not included). Shorter pieces may be considered for the blog (see below). Referencing: Please use the Harvard referencing style and include a full bibliographic reference list for each source quoted. Plagiarism: If your essay was written as part of an assessment item for a course, we advise you submit it to the R2P Student Journal after your essay was marked so that you do not plagiarise yourself. Language: Submissions must be in English. British or American spelling is acceptable but must be consistent. Please edit your piece before submitting. Submissions must not be under consideration with other publishers, and must not be already published elsewhere. • All headings must be in bold and be left-aligned. Subheadings should be italicised. Any custom formatting must be removed before submission. • Do not indent the first sentence of a paragraph. Leave one line of space between each paragraph. • Do not italicise any quotations. Place all quotations in single quotation marks and indent quotes over 40 words. • Please remove any images (unless they are your own original work) from the essay before submission. We welcome contributions on current developments in and reflections on humanitarian crises, mass atrocity prevention, peacebuilding, advocacy efforts and other R2P related themes. The blog is a space for youth to express their thoughts or experiences regarding these themes through commentaries, analytical pieces and creative work (poems, photography, video, short documentary etc.). Word count: For commentary and analytical pieces, aim for 500-800 words. Longer pieces may be considered. Referencing: Where possible, include hyperlinks. Otherwise, please use the Harvard referencing style. Language: Submissions must be in English. If you have a good piece but do not feel confident enough with your level of English, please get in touch. Our editorial team will be happy to work with you to refine your work and provide further guidance. • Do not italicise any quotations. Place all quotations in single quotation marks and indent large quotes. A: Any undergraduate or postgraduate (including research) student can submit their work for the Journal. We welcome submissions from university students all over the world as long as they are in English (translated pieces are acceptable). If you have already graduated, we are happy to accept the article if it was written within 12 months of your graduation date. Please state in your submission email whether you are a current or former student and when your article was written. For the Blog, we welcome submissions from young people, regardless of their student status. Q: When can I submit? A: We publish two Journal issues every year. For our Spring issue, the deadline for submissions is October 1, 2018. We welcome blog submissions all year round. We aim to respond to you with our decision on whether your article/blog will be published or requires revision within 2 weeks of submission. A: If you decided to submit your work to the R2P Student Journal or the Blog, please download this Submission form, fill it in and send it with your essay to r2pstudentjournal@gmail.com. Please make sure you have made all the modifications in line with the formatting rules set out above. A: We believe in open access and the free-flow of information. The R2P Student Journal is a cost-free resource and free to share or cite as long as you give appropriate credit in accordance to Creative Commons licensing.